Is USF's Evelyne Viens The Best Athlete in Tampa Bay? Evelyne Viens is as close to not fair as you can find. As the striker for USF Women's Soccer for the past three seasons, she's shattered every scoring record the school has. Right now she's #1 in NCAA Division I in the following categories: 1.12 goals per game, points (43), and points per game (2.73). 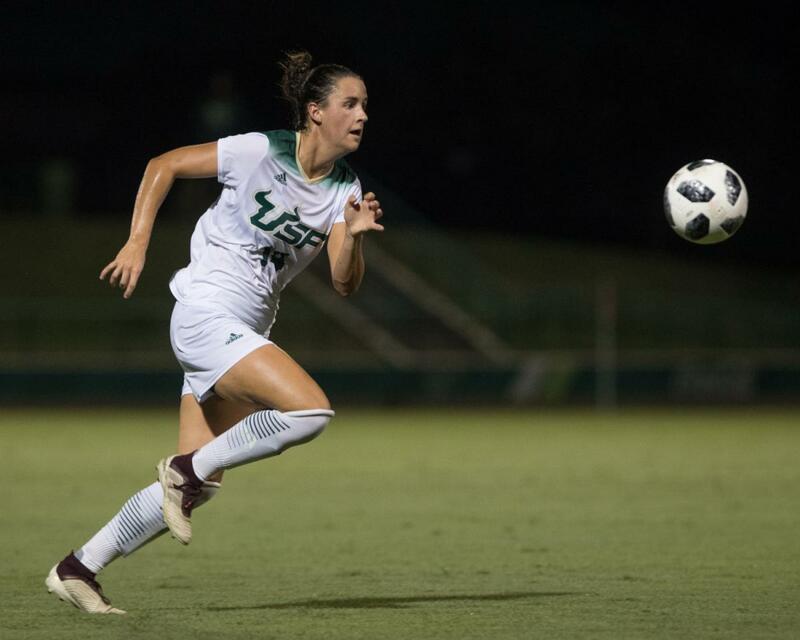 She's basically the Lionel Messi of collegiate soccer, and the junior will lead the #20/17 Bulls back to the NCAA Tournament for the fourth time in five years on Saturday night against the Albany Great Danes at 7 p.m. at Corbett Stadium on USF's campus. Tickets start at just $5, and the winner will take on the victor of Loyola Chicago and FSU next Friday night for the chance to play in the Sweet 16 of the 64 team tournament. There have been plenty of top-flight athletes that have come down Fowler Avenue, but Viens is entering that rare Hall-of-Fame category reserved for the pinnacle of elites. There's 300-plus programs competing in the sport, so to lead the nation in scoring immediately puts you in that category of consideration. But it's not weighing on her mind... yet. "I don't think about that, I'm here to help the team to win. I don't really pay attention to that," she says. But the talent on display can be breathtaking at times. Sometimes it's like she's on the EPL Level of FIFA, and everyone is in amateur football. At some point Viens will play professional soccer, but finishing her degree at USF seems to be the priority for now, meaning she'll return in 2019 for what could be one of the Bulls most-dominant seasons by any athlete ever. "We had some last year that went pro. We had some girls last year go to Spain and Sweden. They're my good friends, and I got some feedback about that, but not that much. I'm just focusing on my time at USF, after my senior year I'll start thinking about that." "Evelyne is a smart kid, and wants to get her degree," says her head coach Denise Schilte-Brown, whose charges won the American Conference regular season championship this year after winning the conference tournament in 2017. "I think this is the best preparation for the pro game is here." And with Canada already qualified for the Women's World Cup in 2019, the native of L'Ancienne-Lorette, a suburb of Quebec City, has to be thinking if she's done enough to merit inclusion for her home and native land. But to this point, she's heard nary a peep from Team Canada. "The head coach will call me if they need me, right now they're in a good position," she says diplomatically. "If I play good, if they need me they will call me. So I'm just going to wait for them." In Canada, cohorts follow the progress, follow a system, and she kind of missed the boat to get into that group," says Schilte-Brown. "They probably don't know how special of a player she is." "When I came as a freshman, everything was new. We don't know that much, and we're trying to get our best out of it, but it was so different than what I experienced at home... we're just a big family right now. I know it's a cliche to say, but how we show up is all about the family. It shows in how hard we work for each other." But despite the results, she still feels like she hasn't found her best run of play yet. "I still have so much more to improve on. I can add more aspects to my game." Look out college soccer if she does. Cover photo courtesy Steven Muncie.